Electric cars are becoming popular in view of the focus on going green to protect the environment by nations all over the world. Soaring oil prices have prompted people to look for other options. Environmentalists were focusing on vehicles that run on gasoline and other such traditional fuels because of the pollution issues. This has put pressure on inventors and automakers to further develop the electric car technology. If you are a prospective buyer of an electric car, you should be aware about the benefits as well as the disadvantages of using an electric car. Of course, a lot of developments have happened, but there are some limitations. Some of the disadvantages are listed below. It is an expensive to own and operate electric cars. The price of electric cars is very high. The major contribution to the price of the car comes from the batteries required to run the electric motor. Electric cars use lithium-ion batteries that are pretty expensive. The batteries last for about 3 to 4 years and after that they will have to be replaced. People who have bought batteries will appreciate as to how the costs add up fast. The second disadvantage is that the batteries of an electric car will have to be recharged frequently. You need to plan in advance as regards recharging. To get the batteries to the full charge, sufficient time has to be allocated. This may not seem to be a problem to you now, but you will realize it when you make an assessment after buying and using it for a while. You could also face problems if the batteries are not fully charged and you have to extend trip or make an unplanned trip. The limitation on the distance that you cover with an electric car between recharges is a big hamper. An electric car may not be the right vehicle for a long distance drive. You need to plan the distance you have to drive before using an electric car on a daily basis. Most of the makes have limitations on the distance that an electric vehicle can run before it has to be necessarily recharged. ZAP, an electric car maker, said recently that the electric cars made by them can cover up to 100 miles with a full charge. This may be encouraging, but many people drive in excess of 100 miles, including to and from the place of work, every day. This limitation is an issue for those who are compelled to use an electric vehicle to commute to their work place as you may get stuck in peak hour traffic jams if your car battery runs out. Yet another disadvantage of electric vehicles is the lack of power. The pickup is not all that good. Anyone doing interstate driving will have to accelerate quickly to merge into traffic at times. A lot of developments have been incorporated in the electric cars in recent years, but many limitations are to be tackled so that it can get wide acceptance among the consumers. 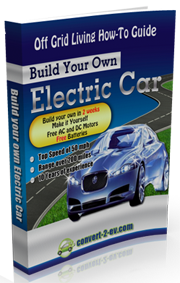 A cheaper option of own an electric vehicle is via a DIY electric car conversion project. You can actually remove the internal combustion engine of a conventional automobile and fit it with a high torque electric motor. However, the job of retrofitting an electric car is easier said than done. If you are looking for an electric car conversion guide, check out the Convert2EV ebook by Les and Jane Oke. The Okes are from Canada and they have been using homemade electric cars for quite a long time. The Convert2EV manual was written based on the experience converting gas guzzlers to EVs. Click on the link below to visit their web site right now.